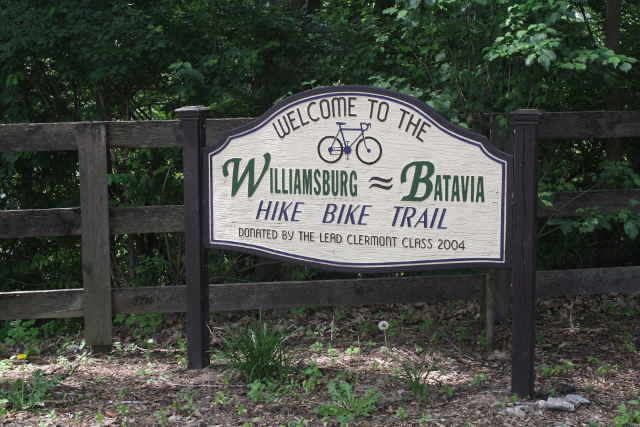 If you plan to walk on the Williamsburg To Batavia Hike Bike Trail, for even a short distance, come prepared. 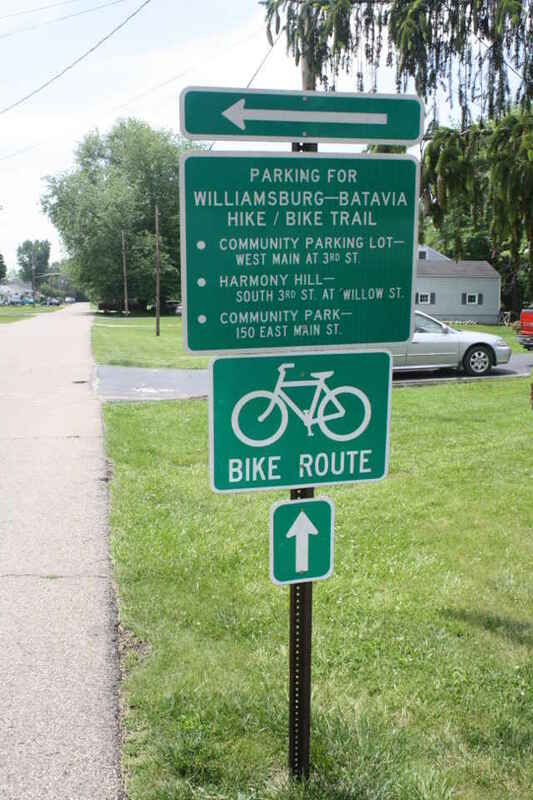 The trail begins at the end of Broadway Road in Williamsburg, and ends after six miles at Zagar Road in Batavia, and when it is finished, it will be a 13 mile trail between the two towns winding through East Fork State Park. For now, however, the trail is more than enough for those seeking a real country experience. We walked on Sunday, May 29, 2016, at 12:20 p.m. It was sunny and 80 degrees. As we drove closer to the trail entrance on Broadway Road, we saw several signs directing us to designated parking areas for the trail. The closest parking area was at the Harmony Hill Museum, which is 1/2 mile away from the trail entrance. This may not be far for those on bicycles, but it seemed a long ways to walk in the hot sun before starting the hike. We opted for parking on a side street that was closer to the trail. The entrance was marked with an informative sign, but no parking space at all, and no restrooms or port-a-potties. 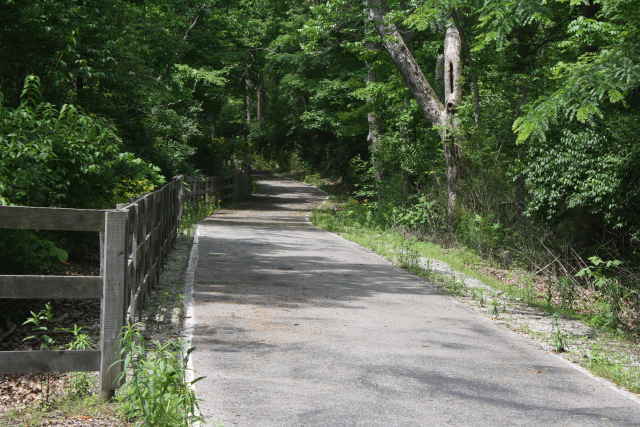 The trail is paved blacktop, and begins with a path gently sloping downhill that immediately immerses you into nature with trees and a wooded hill on one side, and a high wooden slat fence on the other. 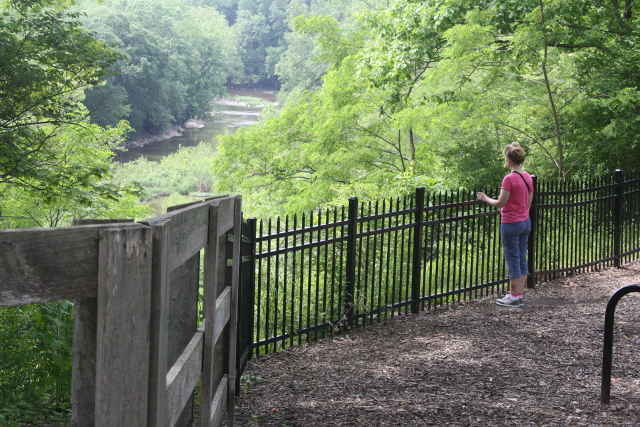 The fence gives way to a beautiful rest area that overlooks a scenic river far below. There are well-kept metal benches and a bicycle rack there as well. 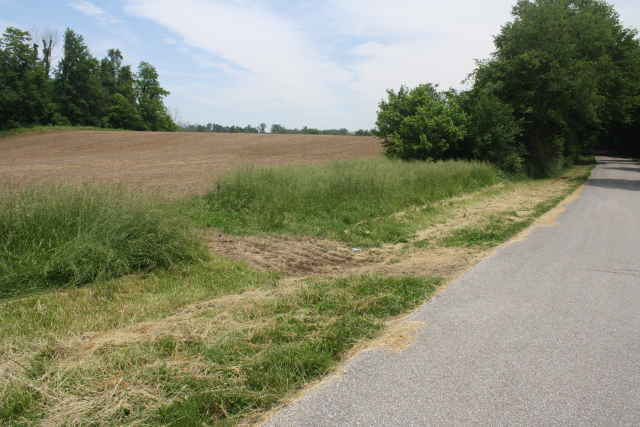 This part of the trail lasts about 4/10 of a mile before the trail becomes part of Williamsburg Bantam Road, where a sign is posted telling that this is a public wildlife and hunting area. Williamsburg Bantam Road begins with a few houses, and then turns into a true country road with trees lining the road, and endless fields beyond them. There was so little traffic, that they had no need for lane divider lines, and bicyclers far outnumbered the cars on the road. We were the only walkers, soaking up the scenery, marching along to the sound of songbirds and rustling of the trees. We turned back when our pedometer reached a little over a mile, although we felt like we could’ve walked there forever. When we reached the last part of the return trip, the road sloped back uphill, and it was challenging, as we were hot and thirsty after walking quickly for over two miles in the heat. We were glad we had parked our car near by. Restrooms: There are no restrooms of any kind. Traffic Noise: No traffic noise at all on the trail. Interesting Features: The area is beautiful, and as natural as it gets. Bring your own bike and necessities as there is no bike rental facility there. What it lacks in amenities, it makes up for with space, peace, and quiet. A great uncrowded place to walk or bike. 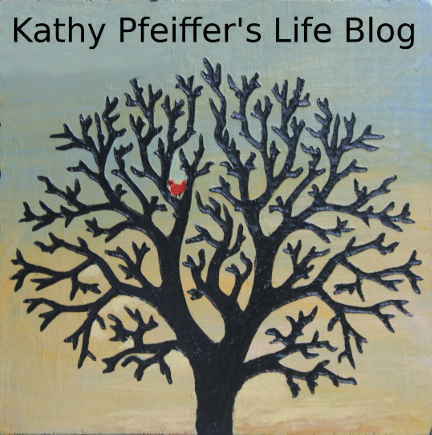 Nature seemed bigger and better everywhere we looked, from the gigantic dandelions beside the trail, to a Monarch butterfly that casually came to greet us. Historic Points Of Interest: Williamsburg itself has a rich history. It was the first village and first county seat in Clermont County, founded by General William Lytle, the first Surveyor General of Ohio. He had lived at Harmony Hill (one of the parking lots for the hike/bike trail), where the stone dairy house is believed to be the oldest building in Clermont County. On the night of July 16th, 1863, John Hunt Morgan and his Confederate cavalry, during their great raid in Ohio, occupied Williamsburg and spent the night. The clock was running out for Morgan, though, and within ten days he was captured. In 1868, there was a gold rush in Batavia and the Elk Lick Valley, which is now under East Fork Lake. Hundreds of prospectors panned for gold along the East Fork of the Little Miami, and the many little creeks that fed it. The Batavia Gold Mining Company was formed by wealthy investors, and mined several sites south of Batavia. It was clear in less than a year that there wasn’t enough gold in the area and the mines closed down, leaving just a few hardy prospectors to continue the search. 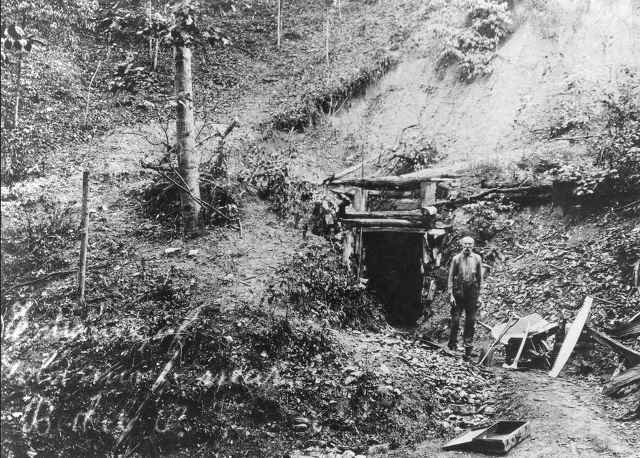 One such miner was John Allen, who worked Cabin Run Creek, crossed by the hike/bike trail, up until the 1920’s. 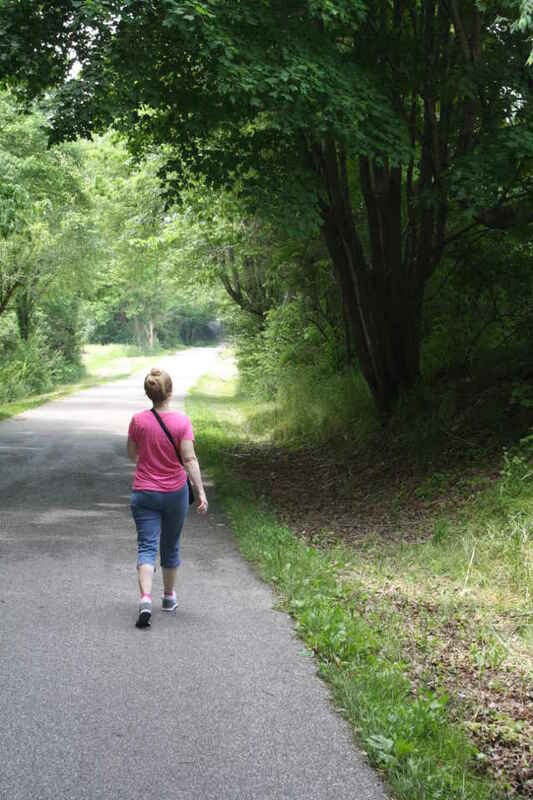 Overall Rating: We enjoyed the peaceful nature experience on this trail, but thought it was better suited for those on bicycles rather than walkers. By making a few preparations, however, like using a restroom in town, bringing water, being prepared to walk to get to the trail, and coming when the temperature is cool, a weekend walker should have an optimal nature experience, where the only surprises are the sights and sounds of butterflies and birds, and a curious rustling in the grass.